ST. PAUL, Minn. (AP) — When it was time to choose roles in the play, Mu Pa chose the part of a Burmese soldier. “I know how to do it,” said the young Karen woman, who was a toddler when Burmese soldiers burned her village and killed her father. Now a 19-year-old freshman at Como High School in St. Paul, Mu Pa is part of an after-school program called Jungle to Jungle organized by the Karen Organization of Minnesota and theater company Dangerous Productions. Through improvised scenes and James Bond-style stunts called parkour, she and other Karen teens tell the story of their flight from Myanmar, life in refugee camps and bewildering arrival in Minnesota. Como students performed last month and students at Harding High School performed Thursday. The Karen, pronounced “ka-REN,” are an ethnic minority from Myanmar, a military state that the Karen still call Burma. Since 2005, in one of the world’s largest resettlement programs, tens of thousands of Karen have arrived in the United States from refugee camps along the Thai border, where some had lived in limbo for decades after fleeing ethnic attacks in their homeland. More than 6,500 arrived in Minnesota, where St. Paul now has the largest and fastest-growing Karen population in the country. Olsen ran an after-school theater program for Karen last year at LEAP High School, a St. Paul public school that enrolls recent immigrants. About 5 percent of students in St. Paul Public Schools are Karen and about 1,000 Karen are enrolled in the city’s high schools, with the majority at Washington Technology and Humboldt, followed by Como and Harding. This year, Olsen helped the Karen Organization of Minnesota land a $25,000 State Arts Board grant to bring the unique blend of parkour and theater to Harding and Como, the St. Paul Pioneer Press (http://bit.ly/1PNb3sM ) reported. At first Mu Pa was terrified to leap over the wood obstacles in the parkour course, let alone speak in front of an audience. Some of Mu Pa’s life experience found its way into the show. When she was 2, soldiers with Myanmar’s military government attacked her jungle village. Mu Pa was sent to live with a grandmother because there wasn’t enough food; when she was 8, she went alone to attend school and live at a refugee camp in Thailand. Just before she applied for refugee resettlement, Mu Pa made the dangerous walk back across the border to Myanmar to seek her mother’s permission to come to the United States. Mu Pa arrived in St. Paul as an unaccompanied minor and lives with a Karen family. She wants to continue her education but feels pressure to find a job, perhaps as a nursing assistant in a senior care facility, so she can earn money to pay for her younger siblings’ schooling in Myanmar. Before Jungle to Jungle, Mu Pa had not spoken to anyone about her past, she said. The experience boosted her English and her confidence, said Jane Sevald, an English as a Learned Language teacher at Como. 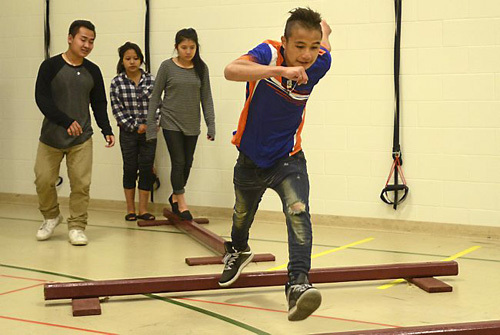 The evening performance last month in the Como gymnasium featured students in more traditional acted scenes interspersed with parkour flips and vaults. In serial fashion, the performance Thursday at Harding will pick up where the Como show left off, with the arrival in Minnesota. On a recent afternoon, 16 Karen students formed a circle in the grass behind the bleachers at Harding. A few girls had hoodies up against a brisk spring breeze. Ryan Borcherding, one of two Dangerous Productions “facilitators,” led warmup exercises, chanting nonsense words “Boom-chicka-boom-chicka” and improvising movements that students copied. The teens laughed and chatted in Karen, a bit self-conscious, but willing to join the game. Then the group worked on the show’s opening scene when a Karen family arrives at the airport in Minnesota and meets their caseworker. Hsar Kpaw, a youth coordinator with the Karen Organization of Minnesota, interpreted as the teens improvised and shared memories of their own arrivals from their subtropical home country between India and Thailand in Southeast Asia. “Snow!” shouted one boy, eliciting laughter. Mu Knay Lay, in a red hoodie and ponytail, was cast as the arriving family’s mother. At 21, she is old for high school, but St. Paul Schools allows enrollment through 21, offering older students a chance to catch up and learn English. Like most of the teens there, she was born in a camp. She came to Minnesota in March 2013 with her mother and father, leaving five older siblings in Thailand. Other Karen families who had traveled with them through Bangkok fanned out to other destinations in the United States for resettlement. She is happy to be here and is making friends. But it hasn’t been easy. Since her parents do not speak English, she navigates the county bureaucracy and writes the rent checks. During the final half-hour, the teens practiced parkour, a sport that involves leaping and climbing over barriers in the urban environment. Olsen got the idea for incorporating parkour after watching Karen students at a school dance doing flips. He thought they’d enjoy it, and he thought parkour could serve as a theatrical metaphor for the obstacles the teens have faced in their journey. Girls and boys formed two lines and then ran full speed toward wooden barriers lined up on the grass. The sawhorses came up to the students’ chests, but they vaulted over with grace.